So: you don’t have enough space in the backyard for a pool or a large entertaining space. But don’t fret – your Australian Dream is not unachievable. It’s all about getting creative with the space that is available. Today, we’re showing you nine ways you can make the most of your limited backyard space. The first thing you’ll need to think about is how to realistically achieve your landscaping goals. The keyword here is realistic: there is simply no way you can fit a movie-style lawn into a tiny backyard. But it might be a dream of yours to have a classic lawn in your backyard. And it’s achievable – you’ll just have to scale it down to size. By that, we mean you can dedicate a corner of the backyard to the lawn and seating rather than the entire yard. 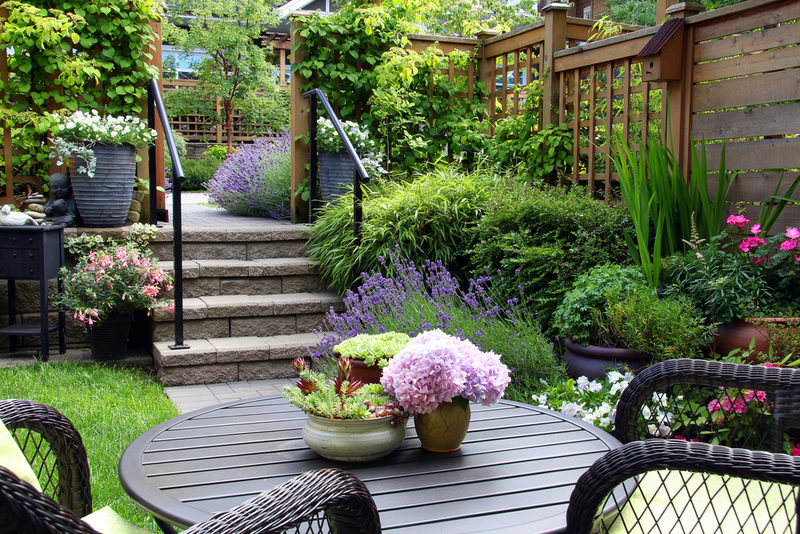 Making the most of your space is all about sectioning your backyard and scaling down your ideas. If one of your backyard dreams is to have a large and flourishing garden, you may have to consider planters that are tiered, vertical, hanging or smaller in general. But don’t let this discourage you – there are plenty of great ideas for compact gardening that can be implemented in your garden. Mirrors are a cost (and space) effective way to give the illusion of more space. By reflecting what is in front of it, a mirror creates greater depth when you look into it, and hence, the illusion comes into play. Whether it’s a contrasting piece of furniture, or a wall dedicated to planters and succulent art, having a focal point is an easy way to tie all your landscaping elements together. Why not draw the eye upwards with dark flooring and lighter furniture and planters? Or perhaps you can direct the eye towards the seating area with brightly coloured cushions. The options are endless, but remember, a focal point is most effective when it is the only one. Your backyard can look poorly designed or even smaller if there are multiple focal points confusing the eye. Have you run out of floor space? Don’t give up before you’ve considered your overhead space. Installing pergolas or ceiling beams are great ways to incorporate elegance and an air of romance to your backyard. It’s easy to use these beams to grow plants, too. Water features can add a touch of relaxation to your backyard. However, they can also be incredibly clunky and can work against the amount of space you have. Therefore, instead of choosing a water feature that occupies the floor room, find ways of incorporating water features into your existing design elements. Narrow water features, for instance, can be installed along the edges of walls or decking. Darkness or shady corners can really make your backyard space feel closed and tighter. The simple solution to this design issue is to install lighting that is simple yet effective. Nowadays, there are plenty of multi-purpose furniture pieces available to buy or DIY. There is no reason why you cannot have an outdoor bar for entertaining guests – simply invest in a Murphy-style bar and it can easily be folded away after use. There are even Murphy-style picnic tables that can fold up entirely, too. A large reason why your backyard might be looking smaller than it actually is can be attributed to a poor choice of flooring. The flooring may be an overgrown lawn or a decking that eats away all the space you have. To open up your backyard, consider re-planning your flooring. Make use of a mix of materials to draw the eye across the space. For example, exposed aggregate pathways, stacked decking and a corner for a small lawn will appropriately section your backyard in a useful manner while being aesthetically pleasing. If you are looking for a concrete contractor that is local, A Better Driveway is the business to call. Our Melbourne exposed aggregate specialists will help to transform your home with our high-quality materials and years of experience. Don’t hesitate to give us a call today on (03) 9308 6112 to discuss your options.